You may want to know how to grow herbs indoors for any number of reasons. Growing herbs indoors is very satisfying. You may be a keen cook who *loves* to use fresh herbs, may be on a restricted diet due to health or needing to lose weight and need the flavour that herbs bring to food. 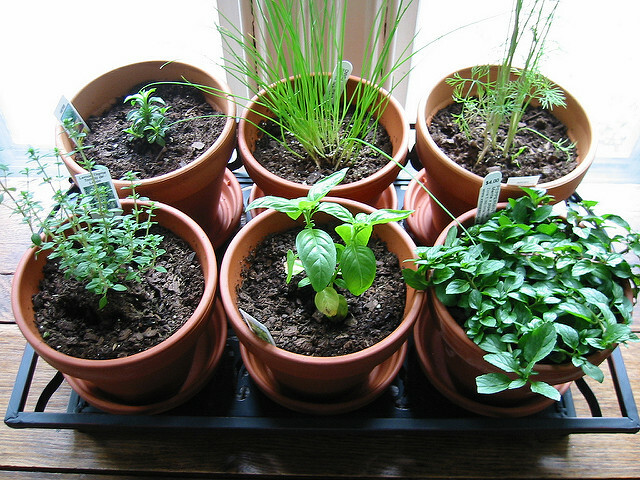 If you don't have a lot of outdoor space, then growing herbs indoors is perhaps your only option. In the winter, not much grows and whilst some herbs are evergreen, they are dormant and too much cutting could affect them. Even if you have an outdoor herb garden, you're not going to get a lot out of it. Or maybe you just love having indoor plants and growing herbs is a win-win - beautiful plants and you can eat them! It's lovely to have some pots of fresh herbs in the kitchen, right where you want to use them. Basil is reputed to be a good fly repellant, PLUS it makes great pesto! 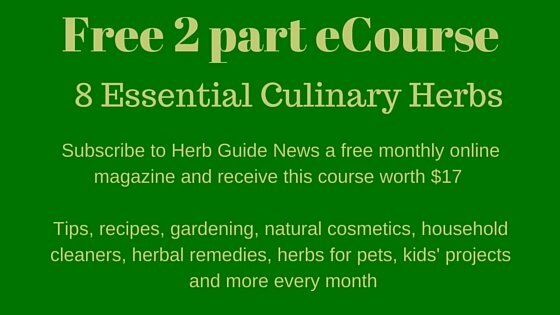 Whatever the reason you want to know how to grow herbs indoors, I'm sure you'll find this issue of Herb Guide News useful. This is an overview, follow the links to find out more in depth information on each option. Starting with the low cost option of pots on the windowsill, exploring why the herbs you buy at the supermarket are doomed to die and looking at the Aerogarden which I *love*. While researching the products, I found a new super super sized Aerogarden which I really really really love and am thinking of selling the piano to make room for it! The photo is at the bottom of the page. We'll start with the most common and cheapest method - a few pots arranged on a windowsill. They could be ordinary plant pots or you can buy herb kits. Which ones? Well, Basil is a great 'trainer' herb for the new grower. It's quick to germinate and the fleshy leaves and stems grow rapidly, giving you almost immediate rewards. In a matter of a few weeks, you'll be picking some leaves to throw into your pasta sauces or whizzing together with oil, garlic, nuts and cheese to make pesto. The stems will wilt when it needs watering and be stiff and upright when it doesn't. It's pretty obvious with Basil what it needs and when, which will teach you how to grow herbs indoors rapidly. Just apply what you've learned to other types. The good thing about growing herbs for culinary use, is that you nip out the tips regularly when you use them. This encourages bushy, young growth further down the plant and you'll get the maximum of foliage. there are dozens to choose from and the limit will be the space you have available. However, because you'll be cutting the plants, they will be sending out young growth all the time and so will stay small and manageable. If you have more than you need for culinary use, then chop some off and freeze or dry it - or give it to your friends! Once they have outgrown their indoor spot, you can move them outdoors either into a larger pot or straight into the ground. They're the ones I use most frequently and they're pretty versatile too. I dry my mint for tea when it begins to get a bit too large as well as use it for sauces and seasoning. The sage gets dried as I use loads at Christmas, chives get snipped into everything as does the parsley. Basil makes fabulous pesto to mix into hot pasta or through a bread mix prior to cooking. Oregano and basil are perfect for adding to tomato sauces for Mediterranean dishes. Thyme is wonderful with mushroom dishes and I drink chamomile tea every day. 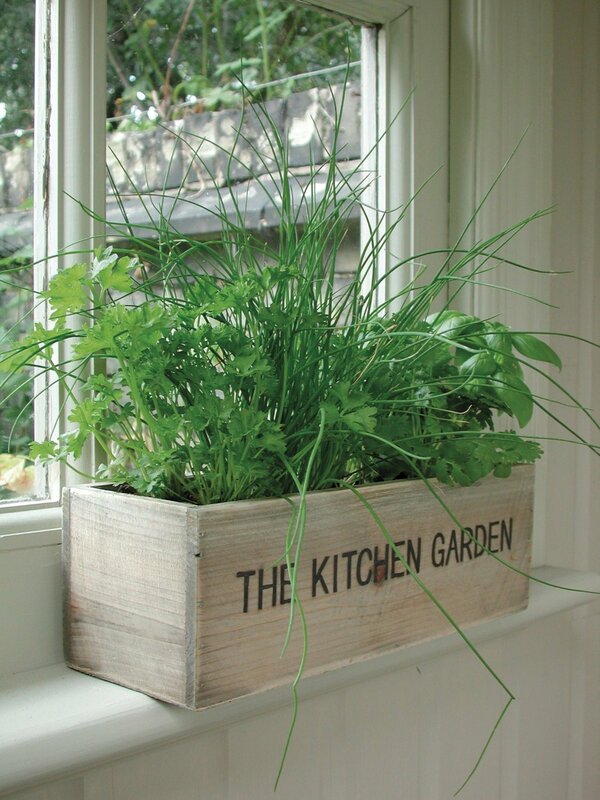 This article about a Kitchen Window Herb Garden will give you some tips of what to consider - aspect, natural light, how to decide and where to source your growing herbs - or you could decide to start them from seed and the article linked here will tell you how. Do not feel 'guilty' when your herbs die - many of them are annuals and designed to germinate, grow and die in the same year. It's nothing you've done - you've not murdered them, it's nature. There's a huge selection of indoor herb garden kits at Amazon - they range from a few dollars for three herbs in lovely terracotta pots to more elaborate or quirky designs. Choose something that matches your kitchen decor. Some kits specialise in herbs for culinary uses, teas or remedies - a huge variety. You can buy growing herbs in pots from the supermarket. Personally, I rarely have any luck with keeping them beyond a couple of weeks. 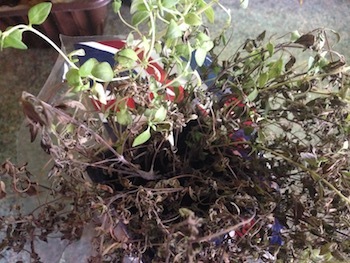 There is a good reason and the short video I've made about 'Why Supermarket Herbs Die' (above) will tell you. Briefly, they're designed to have a shelf life - you get lots of very young plants in the pot, grown in seed compost which only has nutrients for about six weeks, they're grown under 'perfect' conditions of heat and light, shipped out to cold supermarkets then moved to kitchens where the temperature changes every time the cooker goes on. They don't have the correct type of leaf to cope with the new growing conditions and by the time they've caught onto that fact, it's too late. They grow 'leggy' and keel over. They're doomed from the start. By growing from seed or buying from a nursery, your plants will become better acclimatised to the growing conditions in your house. However, it is a way to have herbs indoors and handy for your cooking without having to wait. They're relatively cheap to buy and if you can be bothered to separate them and pot them on, giving them lots of tender loving care, you *might* get many months of growth out of the plant. If you want to see the full video and explanation, click the link above. 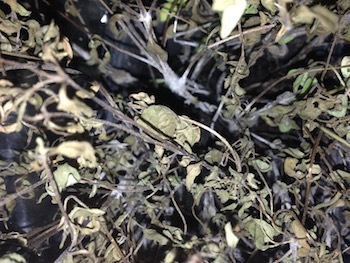 The photos below are of a Thyme plant I bought from the supermarket - you can see how it has died on one side and the grey mould which has appeared on the stems. There was no hope for this plant at all and it happened virtually overnight after bringing it home. It was wrapped in a polythene sleeve and when I went to use the plant the following day, it had died off. This is my Aerogarden - I had wanted one for a long time, but my kitchen is extremely small and I just could not see where one would fit. I have grown a lot of herbs which I've used fresh and I've frozen or dried the surplus. It's simple enough to do and is well worth the effort. They're not cheap to buy - you can normally find them on offer under the $100 mark. They would be last year's colour or model - nothing wrong with them at all, but as you know, kitchen design is linked in with fashion these days. I'm fairly certain you could buy them secondhand too - think about looking in eBay or local selling groups. I find that the herbs last for around six to nine months with huge growth. I harvest herbs from mine in large quantities after about two months. I dry or freeze the surplus. I love my Aerogarden. They start from under $60 for a three pod version. You're not limited to growing herbs either - you can grow tomatoes, flowers, salad leaves, chillies amongst other things. You can buy 'blank' pods to sow your own seeds. They look so cool in the kitchen - beautiful, healthy plants under the growing light provide a focal point as well as being entirely useful. I've just had a quick look at Amazon to see which Aerogardens they have on sale and LOOK AT THIS!!!! 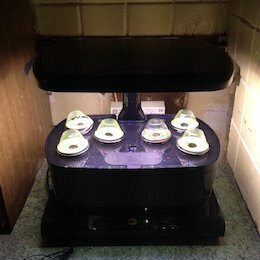 A 24 pod Aerogarden FARM! How amazing is that! I wouldn't have to choose between tomatoes and herbs, I could have both and salad leaves and chillies! Quick 4 minute video showing my Aerogarden, siting, setting up and some growth photos at one, two and three weeks. You'll be amazed - I was! The ultimate in How to Grow Herbs Indoors - you can't fail with this. If you have any questions on how to grow herbs indoors, please contact me There's a little box there which will magically expand as you being to type. Alternatively email me at Lizald5 at aol dot com - that box is monitored all the time.